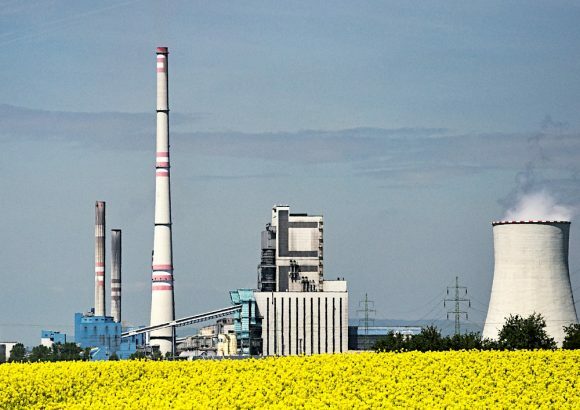 Germany has set itself a large goal to phase out coal and nuclear power at the same time in order to complete the energy transition towards renewables. While all nuclear power plants are said to be shut down by 2022, coal will continue to be a major form of stable energy supply until at least 2038. 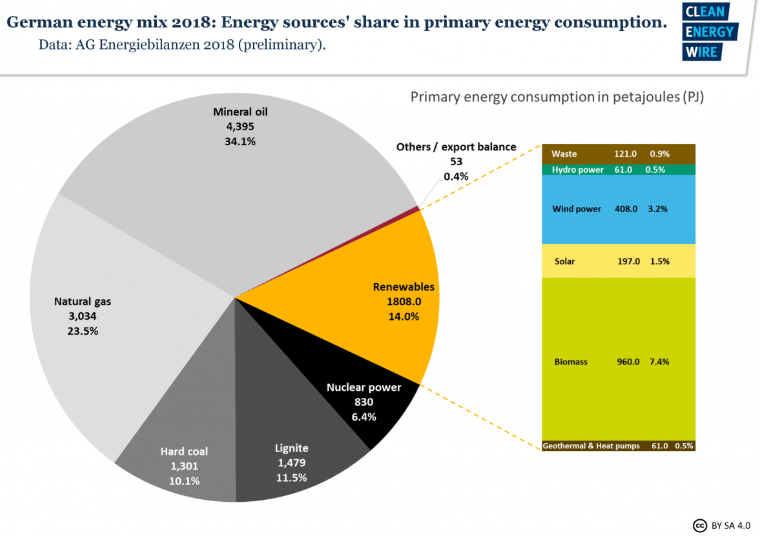 In 2018, the energy contribution from fossil-fuel based sources decreased by 1.8 % since 2017. Brown- and black coal have dropped for the 6th time in the last decade. 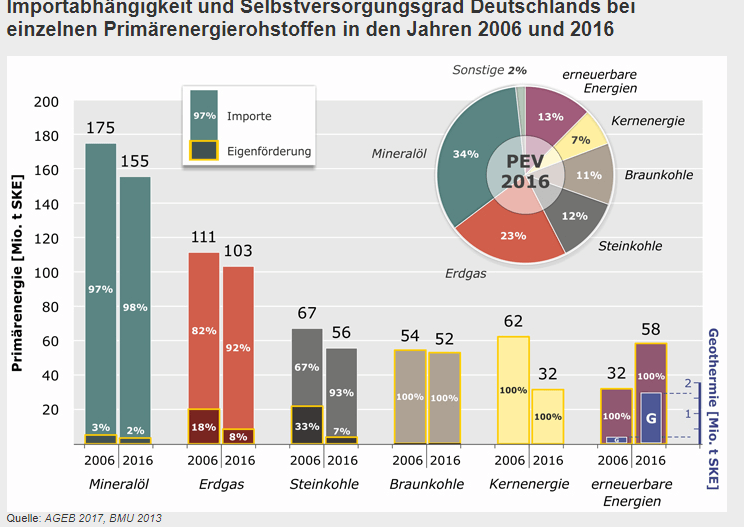 The figure below shows the primary energy consumption in Germany between different energy sources. Presently only 14 % of the energy consumption comes from renewable energy assumption while gas, coal, and oil make up to two thirds. The 2018 Annual Report released by the Working Group for Energy Balance states that black coal has decreased by 11.2 % since the usage of black coal in electricity generation has been reduced by 16 %. Brown coal also saw a decrease but only of 1.9 %. However, Germany has large resources of brown coal remaining in the ground, which makes it a solid and continuous provider of baseline power for electricity. Germany’s natural gas and oil resources are not abundant and economically profitable enough to make up for the gap that would result from the immediate cut of brown coal. The graph below shows the relative percentage of domestic and imported primary energy resources. The rectangles highlighted by yellow correspond to nationally available resources, respectively. The bars displayed as ‘Braunkohle’ alias brown coal and ‘Kernenergie’ (nuclear energy) are the only resources that are locally sourced. All others, such as gas (‘Erdgas’), oil (‘Mineralöl) and black coal had to be imported from other countries with Russia being the most important partner. In 2016, Germany was ranked as the 6th highest import nation for black coal. In fact, since the rapid shutdown of nuclear plants in Germany, the created energy gaps had to be filled, which resulted in a rapid rise in coal consumption. It seems ironic, considering that with the endorsement of the Paris Agreement, Germany agreed to do everything in its power to reduce greenhouse gas emissions. Germany exports a lot more of its generated energy than it uses. 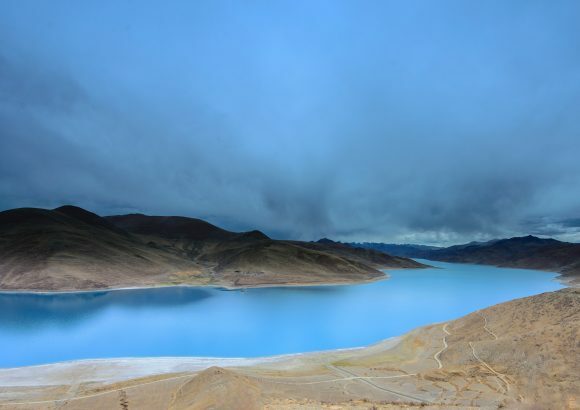 However, it is most likely that this positive balance is associated with the generation of renewable energy in the warmer months of the year where less energy, in general, is needed, leading to a surplus on the grid. Current German coal mines provide approximately 70-80,000 direct jobs in the concerned regions. The areas for the coal mines are predominantly located in the eastern parts of Germany. One of the major challenges to the exit from coal is to find solutions for the affected people who have been living and working in their homes for decades. The coal industry is part of the culture in those areas, having been present for more than 200 years. It is not an easy task to find an alternative or substitute. It is also understood that the transition from coal-based energy requires alternative reliable energy sources. However, it is not a good idea to invest in the extension and deepening of harbors like in Brunsbüttel in order to encourage the import of liquified natural gas (LNG). The idea to import LNG from the US is, perhaps, geostrategic but from a transparent and environmental perspective not ideal. Germany is against fracking in unsafe areas while the United States is using fracking on a regular basis to extract valuable gas from the ground. Importing gas that may have been generated through fracking where it could harm the surroundings should not be used in Germany if we are to stay truthful to our principles. Germany is moving in the right direction in its goal to transition from a fossil-fuel dependent economy to a renewable energy economy. Throughout the last decade investments and subsidies have been allocated to the renewable energy sector in addition to the extension of the national grid. 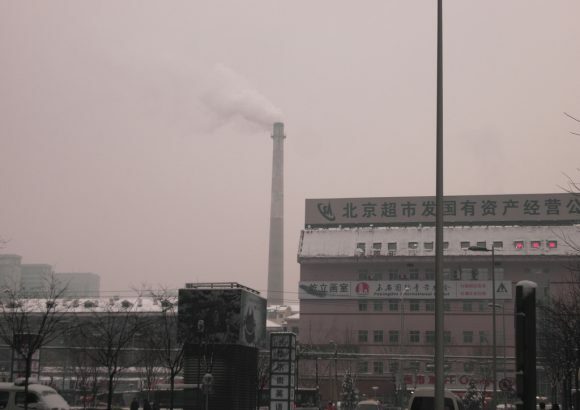 However, the brown coal sector has been largely untouched until only just recently. It is in this area, where Germany needs better energy transition policies. Despite the 70,000 jobs that depend on the continuity of the mining operations, the German government needs to take responsibility and provide alternative employment solutions for these coal miners. We urge you to send the following message to Mr. Diercks (General Manager of the Federal Association for Brown Coal), Mr. Altmeier (Federal Minister of Economic Affairs and Energy), Mr. Maaßen (General Manager of Federal Association for Brown Coal in Bergheim. Germany has agreed to become predominantly carbon neutral by 2050. To achieve this goal the government needs to develop a just transition plan to meet the employment needs of those who will be affected by the closing of brown coal mines. Those affected should be consulted in the development of such a plan.